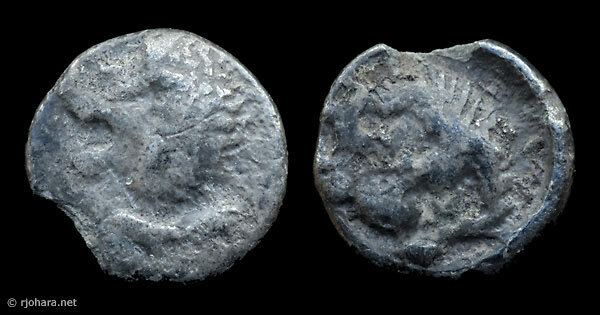 The obverse type of these coins, which resembles the obverse type of the common archaic Milesian twelfth staters, has led some people to assign this lion scalp series to Miletus. Koray Konuk now believes they are not Milesian but instead belong to Mylasa, the principal city of Caria under the Hecatomninds, about 35 miles southeast of Miletus near the head of the Bargylian gulf. He dates them to about 420–390 BC (Konuk, 2002: #833–836). The philhellenic Carian satrap Hecatomnus (ruled 395–377 BC) and his son and successor Mausolus (ruled 377–353 BC) consciously imitated earlier Milesian designs in their own coinage, and so this attribution is entirely reasonable. The styling of the obverse lion head, with its short snout and somewhat bulbous lower jaw, is indeed more similar to the later Carian lion designs than it is to the earlier lions of Miletus. Note: Koray Konuk recently completed a doctoral dissertation on the coinage of the Hecatomnids (Konuk, 1998). When that study is published it may be possible to give fuller account of these coins than I have provided here. Futher note: Konuk has recently described several specimens of this type that appear to have Carian inscriptions, probably representing the city ethnic for Mylasa (Konuk, 2006). His conclusions have not yet been incorporated here. 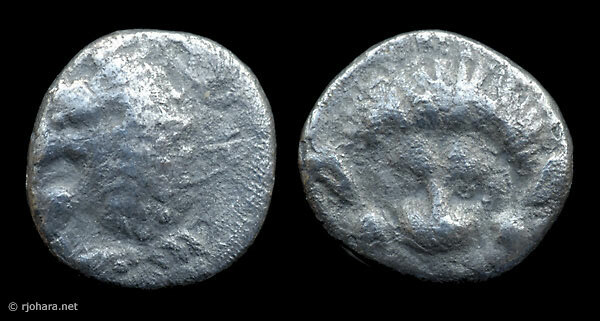 As in the early Milesian twelfth staters, the obverse type of these coins is, strictly speaking, a lion protome (with foreleg visible and head reverted), rather than a simple lion head. The reverse lion scalp design is very similar to the obverse of the silver lion/scorpion coins of Miletus or Mylasa (but not to the obverse of the electrum variety). The weight standard of these coins is not clear to me. Konuk (2002: #833–836) describes them as “Milesian standard hemiobols.” Sear (1979: 450) identifies the Hecatomnid standard as being based on a silver tridrachm-stater of about 12.25 g (Hecatomnus) or 12.7 g (Mausolus). This would yield a hemiobol of 0.34–0.35 g. The four specimens described by Konuk weigh 0.38, 0.50, 0.47, and 0.43 g, a rather large range for silver coins of a single denomination. RJO 36. Silver hemiobol? (0.36 g), 420–390 BC. Obverse: lion protome right, head reverted to left. Reverse: lion scalp facing. RJO 37. Silver hemiobol? (0.49 g), 420–390 BC. Obverse: lion protome right, head reverted to left. Reverse: lion scalp facing.